Home » What is Turnaround? Anxiety disorders are on the rise and affect up to 20% of kids. Turnaround was developed as a way to directly treat children quickly, creatively and effectively. 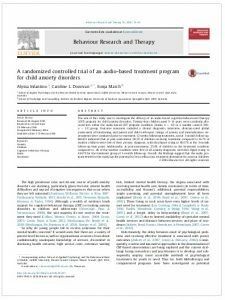 It is a 10-part audio program with accompanying workbook that is based on years of research and experience including the rigorous standards of a random controlled study. It will teach your child what anxiety is, how it works, and how to overcome it. 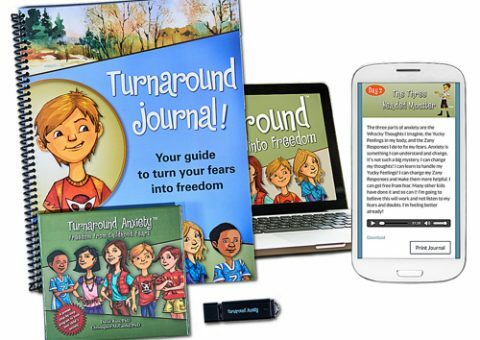 Turnaround is truly a unique program because it speaks directly to your child, it can be used at home, is available immediately and proven effective. (1) The heart of the program is the audio treatment program. 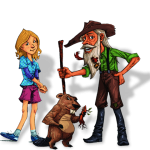 This is a ten-part adventure story that creatively communicates the principles of Cognitive Behavioral Therapy (CBT). Audio books have more emotional resonance than video. See supporting article here. (2) There is also something we call the Chill kit that includes several breathing and relaxation exercises. (3) The Journal is used after listening to each part and gives your child a chance to interact with the content using elements like art, puzzles and games. (4) Dr. McCarthy and Dr. Russ discuss in detail information that is important for parents. (5) There is also an interview with a neuropsychiatrist discussing the medical aspects of anxiety and treatment. During a lesson your child will listen to a 20-25 minute adventure and then complete the exercises in the Turnaround Journal. Each lesson can be broken into smaller amounts of time to easily adjust to the needs of your child and family. The “lessons” are woven into an adventurous camping story in which six anxious kids take a 10-day hiking trip with Dr. David, Dr. Chris, and Emily, who is a teen mentor to the kids. Each day is a separate lesson that builds upon the previous one. 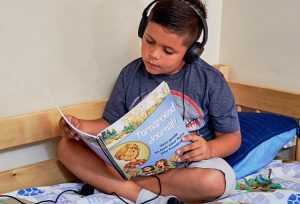 Since the program is audio your child’s imagination is fully engaged and your child will naturally make the lessons much more personal. He or she becomes part of the adventure! In the program kids speak to kids or interact with interesting characters. Fourteen child-actors and six adult-actors were hired to ensure that your child would remain interested in the material and really want to hear it! This is not a lecture or dry description of what to do. This is a story with developmentally appropriate language, ideas and explanations that are part of an interesting outdoor adventure full of characters with whom your child will identify. The result is a clever blend of proven treatment methods inside an exciting story that your child will love, guaranteed or your money back! Does it really work, honestly? We are all familiar with products and services that make claims that are exaggerated or false just to sell a product. We imagine many of you feel that same cautious skepticism about Turnaround. We don’t blame you. This is about your child and you may be at your wits end. The last thing you need is to spend money or get your hopes up on something useless. In the psychological field there will never be a treatment or program that is 100% effective in every situation. If you get a significant improvement from a specific treatment 60-70% of the time then you can be confident that it is extraordinarily effective. First of all, it is based on cognitive-behavioral therapy (CBT) that has impressive amounts of research supporting its effectiveness for treating anxiety. Second, Turnaround was subjected to the rigors of a both a randomized controlled study (considered the most conclusive kind of research) as well as several case studies. Third, parents and kids tell us over and over how it has changed their lives. Fourth, we have been doing this for years professionally and we are dads with formerly anxious kids. Fifth, it is a really good story. Seriously, we are still surprised how well it came out. The Turnaround anxiety program was effective in: (a) reducing the clinical severity rating of the primary diagnosis, (b) decreasing the number of diagnoses held (see point 4 below), (c) improving overall level of functioning, (d) reducing child and parent reports of anxiety symptoms, and (e) reducing the experience of anxiety. Pretty good, right? For all measures, these improvements were either maintained or improved upon at 3-month follow-up. In other words, the changes stuck. The percentage of children free from their primary diagnosis is comparable to that found in traditional face-to-face CBT (cognitive behavior therapy) for child anxiety. We love therapists. We are therapists. But not everyone can get to therapy or find the right kind of therapists. Sometimes you can’t get a kid to go or participate. Plus, with Turnaround you don’t have to wait to get started and you can do a lot of work in a shorter period of time. Children often have more than one anxiety diagnosis. The results from this research suggest that Turnaround is not only able to reduce primary anxiety diagnoses, but comorbid disorders (occurring at the same time) as well, with 66.67% of the children being free from any diagnosis at 3-month follow-up. We designed it to work with a variety of anxiety disorders and were really happy the study confirmed we pulled it off. So, does it work? Yes. Of course not always but this is not a not just a product to sell to worried families. This is a clinical, carefully designed treatment program that works as successfully as most other treatments. Plus, we will give you all your money back if it isn’t effective. You won’t get that option at your doctor’s office. 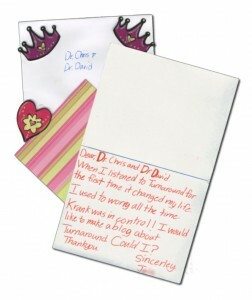 Take a look at some of testimonials from happy parents and children. Full disclosure. Anxious kids wear us out and break our hearts. We all wonder if this is our fault. It can feel like nothing is working. We, Dr. McCarthy and Dr. Russ, as part of the program provide parents with the necessary information, needed encouragement and support to get through this. We have the unique perspective of being on both sides of the treatment process. Anxiety has its own set of rules. If you don’t know how it works you can inadvertently make anxiety worse even though you are genuinely trying to help. Although Turnaround is directed to children the parent information will help you effectively coach and talk to your child with a shared language and framework from the Turnaround program. There is every reason to hope. The Turnaround program can give you the strategies and knowledge you need to help your child. Watch a 90 seconds interview with Dr McCarthy in a morning talk show explaining how the Turnaround program helps children overcome their fears.